Friends, those of you who have been following me know that Mr. Frugalista is my lackey official furniture buyer. 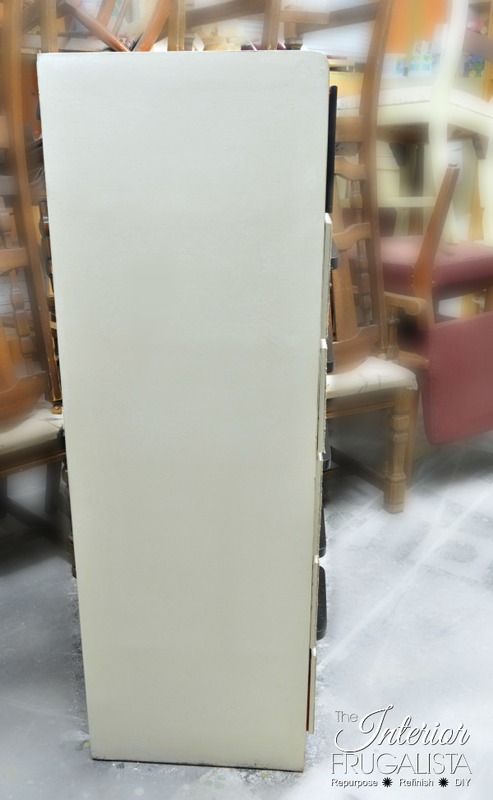 Several months ago he came across this Vintage Art Deco Waterfall Dresser at a local online auction site for...wait for it...$5. When he asked if I would be interested, he couldn't get it home fast enough. Then life happened and it sat in the back of our shed all summer. Last month while organizing the shed to store our outdoor patio furniture for the winter I had Mr. Frugalista bring the dresser inside. Shortly thereafter Dixie Belle Paint Company contacted me and I instantly knew this would be the perfect piece to play with their products. *Thank you Dixie Belle Paint Company for providing the paint products for this project. All opinions are 100% that of my own. This post contains affiliate links so you can find the products I used. See my full disclosure policy. These are the Dixie Belle products I used to complete this project. Now you'd think I would have taken a picture of the containers before I started using the product but I couldn't wait to get my hands dirty. This is what the dresser looked like before I got my hands on it. Judging by all the stickers, it probably spent several years in a boy's bedroom. Other than crayon strokes, stickers, and that lovely faux bois paint finish, it was in pretty good shape. After removing all the stickers with a razor scraper, any deep gouges were filled and sanded. 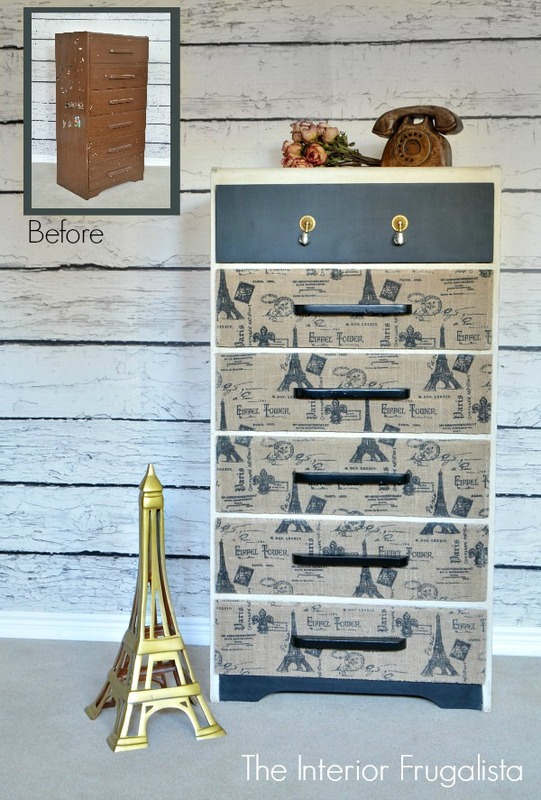 I left the drawers alone because they were getting decoupaged and I wanted a dark color behind the fabric. 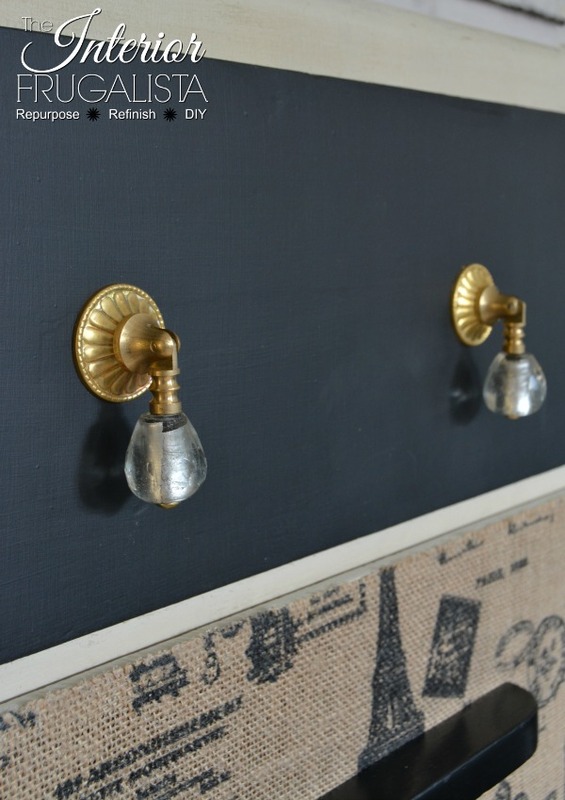 The carcass was painted with Dixie Belle chalk paint in the color Drop Cloth, which has tan undertones. I've used a lot of chalk paint brands since I've been refinishing furniture and I was shocked at how I almost got complete coverage with just one coat...over dark brown. The paint dried so fast that by the time I finished the first coat, it was dry enough to start the second. To get complete coverage, I applied a thin coat of paint by dipping the tip of the bristles in water and then the paint. In less than an hour, I had the carcass painted and ready to apply a French Postmark stencil onto the top. 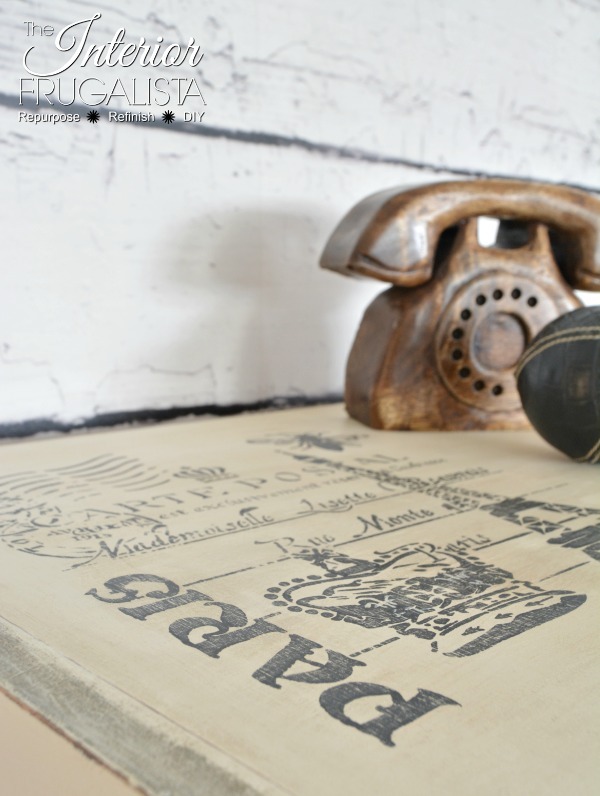 Once the black chalk paint was dry I distressed the graphic a little with a sanding block. Before starting the next step I watched tutorials on the Dixie Belle Paint Company website. I was surprised to learn that you don't have to apply a protective finish over their paint. Old habits die hard, and besides, I was dying to try their Best Dang Wax. I applied the wax onto just the tips of the wax brush and was impressed with how a little went a long way. I decided I wanted an aged appearance and normally this is where I apply dark wax. Instead, I put the Dixie Belle Van Dyke Brown Glaze to the test by applying it over the wax. I quickly learned, like their wax, a little goes a long way. I also learned that it dries quickly so it's best to work in sections. I found I could move the glaze and wipe off the excess much easier if the wax was still wet. 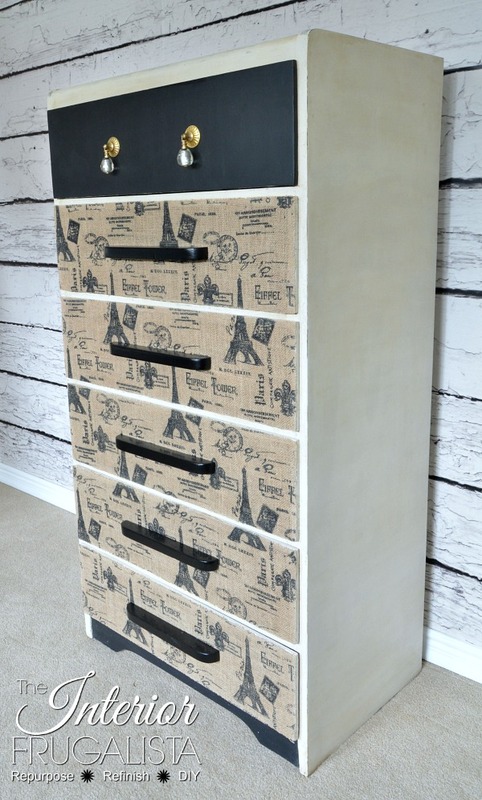 The sides of all six drawers both inside and out were chalk painted with Dixie Belle Barn Red. Had I used extra care I could have gotten away with just one coat of RED...that's never happened! I did leave just one coat on the outsides because I knew the paint would wear with opening and closing the drawers. The insides got a second coat. 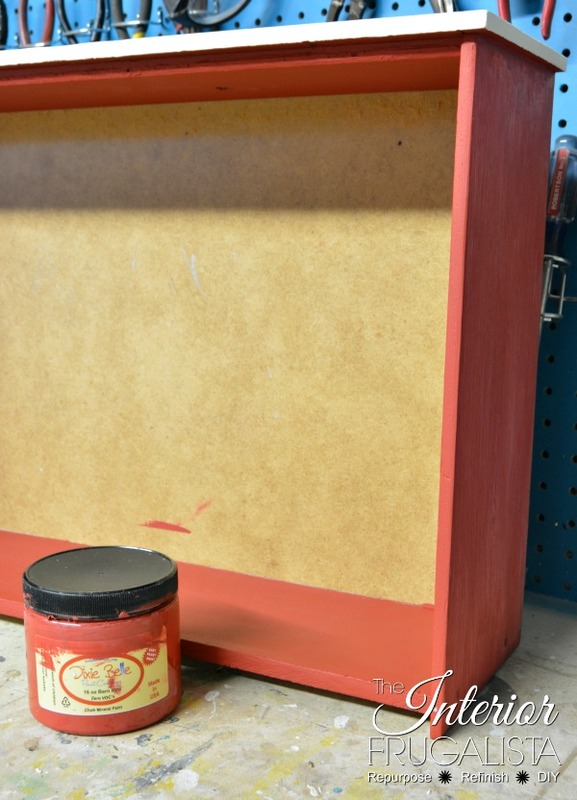 Instead of applying a second coat of paint, I used Dixie Belle Voodoo Gel Stain in the color Tobacco Road over the Barn Red chalk paint on the sides of each drawer. This should help protect the paint from rubbing off but also added depth to the color. Brush on - wipe off. 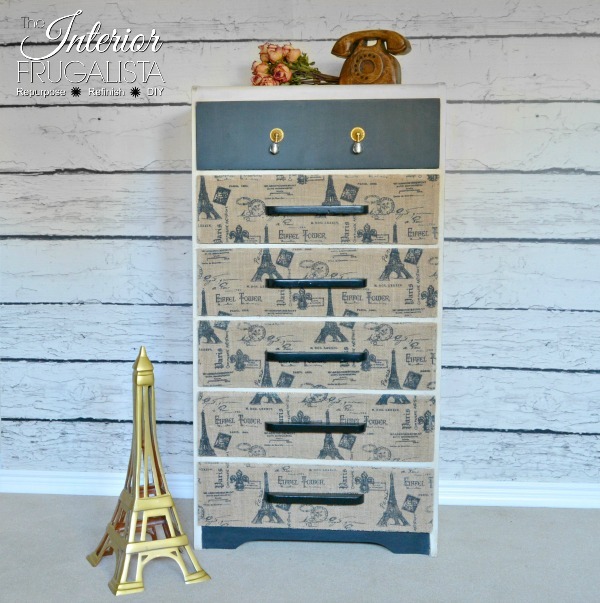 I always like to line the drawers of my pieces and had this lovely striped wallpaper on hand that I picked up for a song at the Habitat ReStore. I use wallpaper paste to apply all types of paper because I get fewer air bubbles and wrinkles. I bought Paris Burlap fabric a couple of years ago with the intention of upholstering a bench. Inspiration struck and I decided, considering the drawer fronts would have needed sanding back to the original wood, that I would save myself loads of time by decoupaging fabric onto the fronts instead. Lay the dresser on it's back with all the drawers in place. 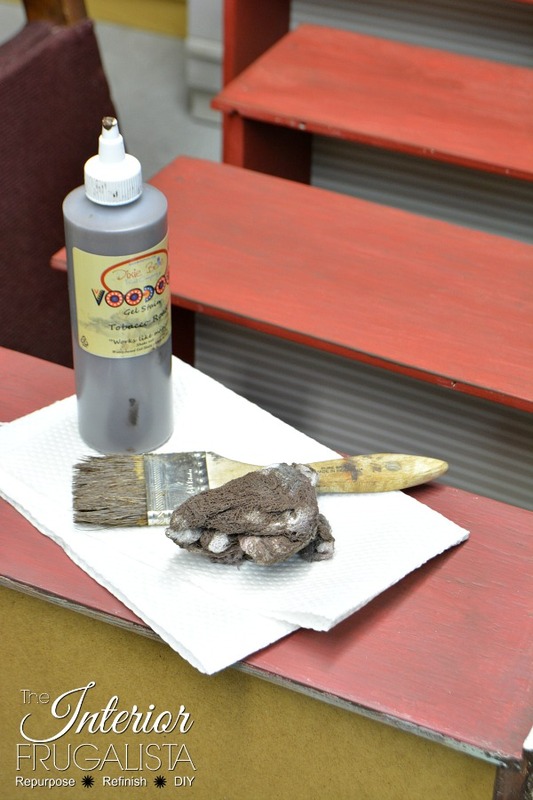 Apply a generous amount of Mod Podge over each drawer front using a foam brush. 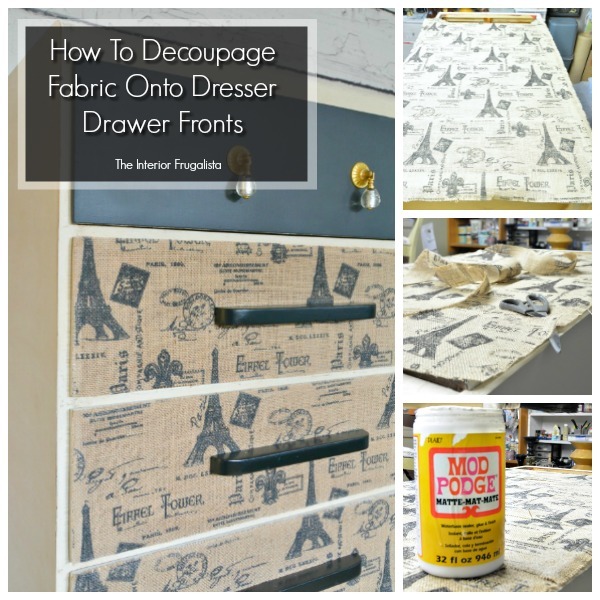 Lay the fabric across all the drawers, straightening and flattening the fabric with your fingers as you work. Cut the excess fabric around the perimeter of the dresser and in between each drawer with a sharp pair of scissors or craft knife. Reapply Mod Podge wherever there isn't a tight bond around the edges. 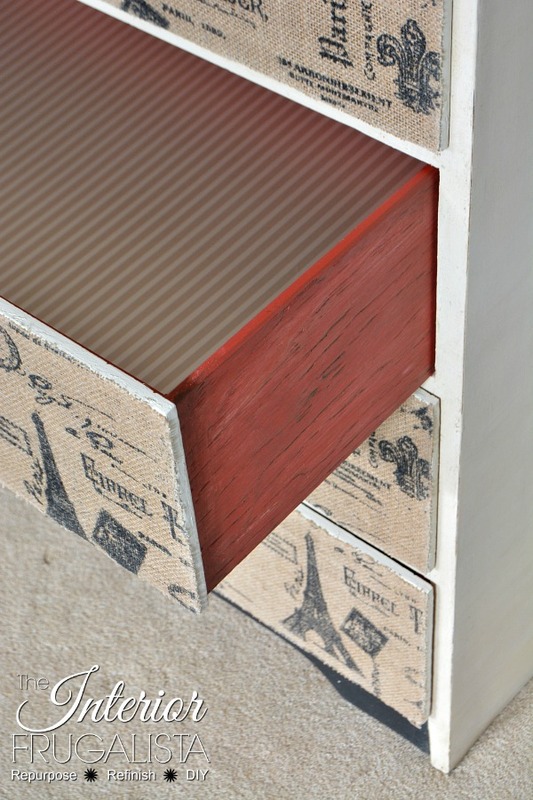 Using a sharp craft knife cut the extra fabric around each drawer. A sanding block will provide a nice crisp edge. 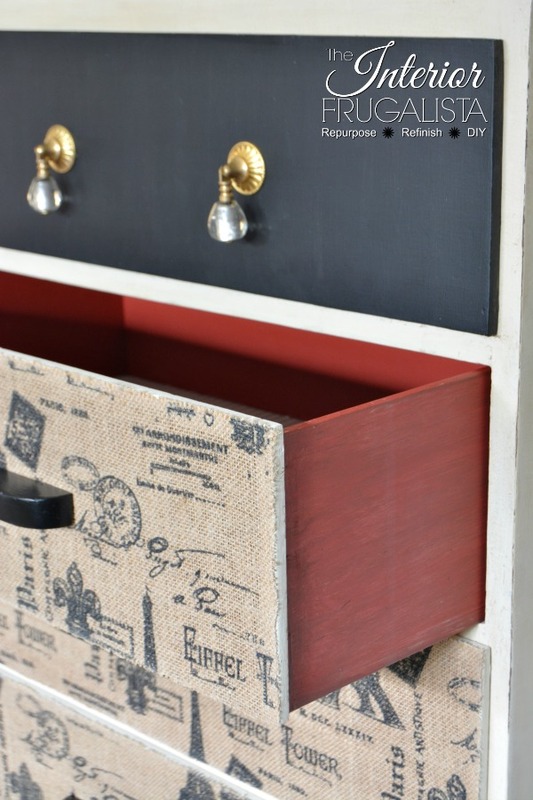 I wanted the top drawer to have contrast and so I took the time to sand it smooth and chalk paint it black. 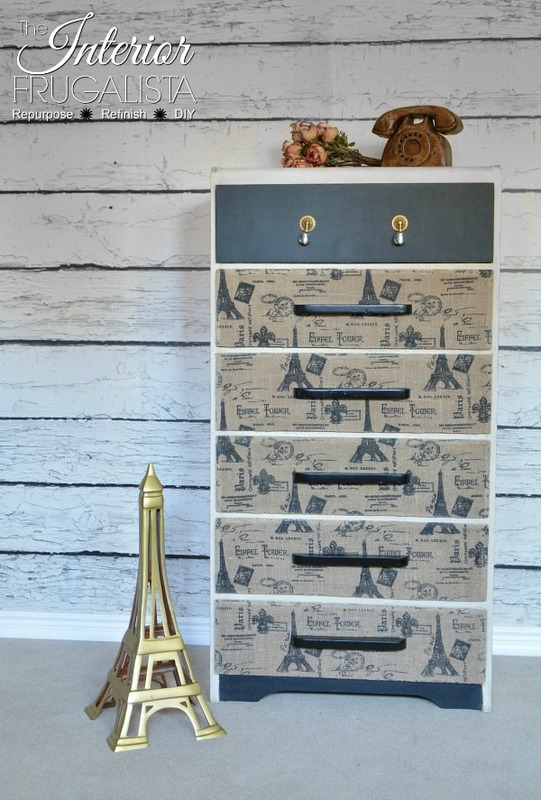 The dresser skirt was also painted black to create balance. I contemplated adding new drawer pulls but decided to spray paint the originals black. The jewelry is in these gorgeous gold and clear glass drop pull knobs! I bought them around this time last year during this Canadian girl's maiden voyage to Hobby Lobby in Niagara Falls, New York. 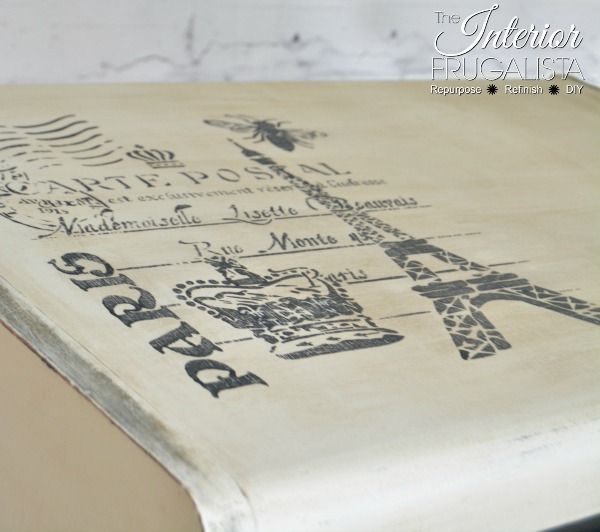 Here is another look at the Paris Postmark stencil on the top of the dresser. 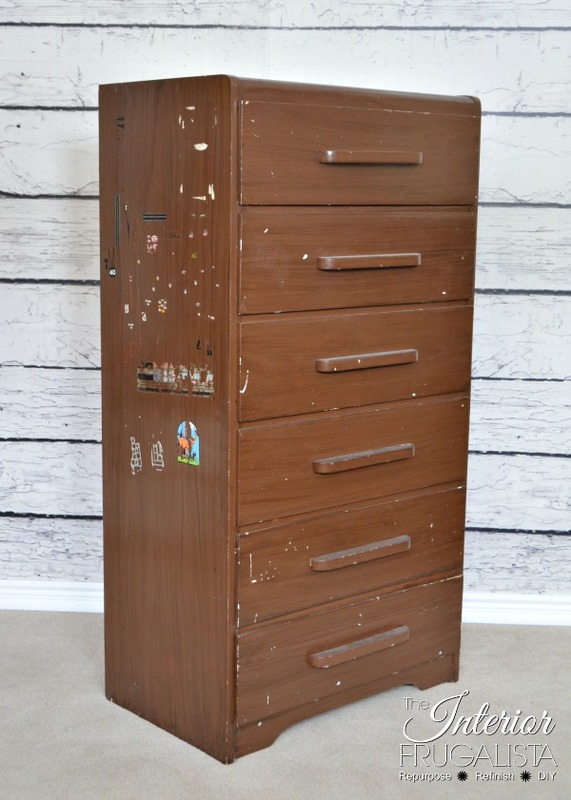 If you like my unique one-of-a-kind Vintage Waterfall Dresser, please share it with a friend and/or save it on Pinterest. Thank you Dixie Belle Paint Company for supplying the paint products for this project. I really mean it when I say that I love working with your products. The only negative feedback I have is that it is not readily available in Canada. To see more furniture makeovers using Dixie Belle Paint Company products visit Antique French Tea Table and Embossed Metal Accent Tables.